The ability to work and provide value to a company, a community or even just a neighbor has given Americans purpose for generations. A company such as the Mi-T-M Corporation not only provides employees the opportunity to find purpose in their life but also produces a product that enables the end-user to add value to their life as well. The Mi-T-M Corporation was founded in 1971 by A.J. Spiegel, a professional paint contractor, who recognized the need for a portable pressure washer. 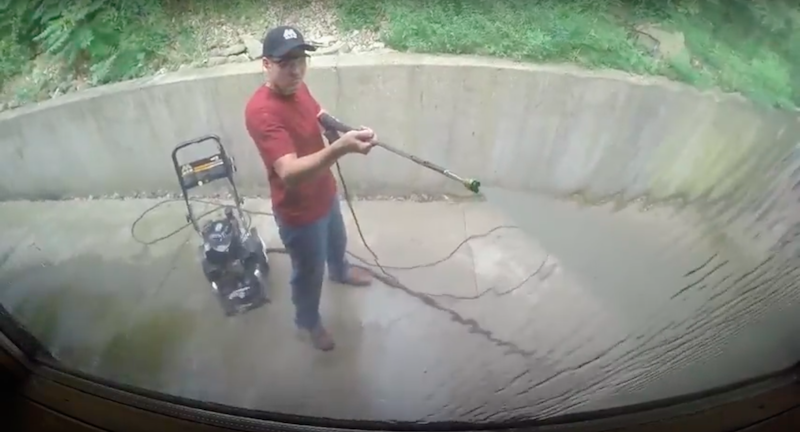 He used his vast knowledge of equipment to design and build an efficient 1000 PSI pressure washer. The self-contained, gas-powered unit quickly became known as the “Mighty 1000.” It wasn’t long, and the name was abbreviated to “Mi-T,” paired with the Roman numeral “M” and became the company name…Mi-T-M.
Over 450 hard-working employees uphold the promise to deliver unmatched performance — from product quality to the dedication of each employee who does what’s right for customers — every time. Today, the Mi-T-M manufacturing facility includes a fabrication division, 23 production lines, 11 CSA test rooms, a fully automated 800-foot conveyor line and expansive shipping docks. This allows Mi-T-M to manufacture, test and ship hundreds of units and parts every day. 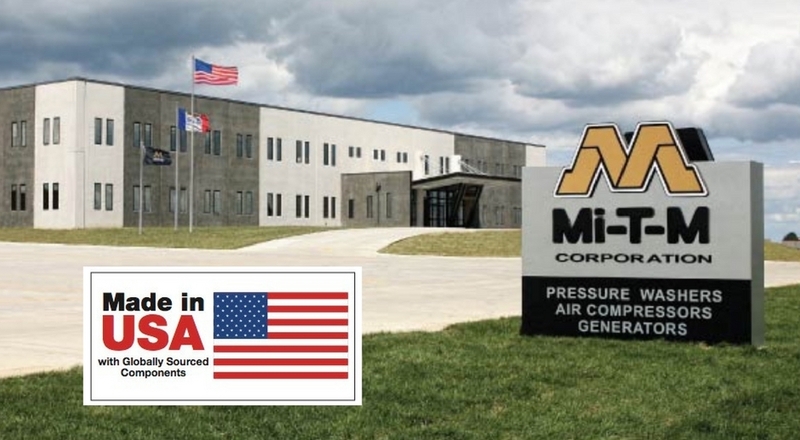 By displaying a Made in USA sticker on equipment, Mi-T-M is reassuring customers that they’re getting the highest-quality equipment on the market, because building equipment in Peosta, Iowa means agility and flexibility and never compromising. This American manufacturer would like to express its gratitude to loyal customers who continue to travel on this incredible journey with them. From mold, mildew, and mud . . . to grease, grass stains, and grime, there are simply some jobs too big for your “garden variety” garden hose to tackle. That’s when you need to bring in the big guns. A residential pressure washer will make any outdoor clean-up task quicker and more efficient. In fact, most pressure washers pack 75 times more power than hoses. That’s a lot of strength to wield in your hands. 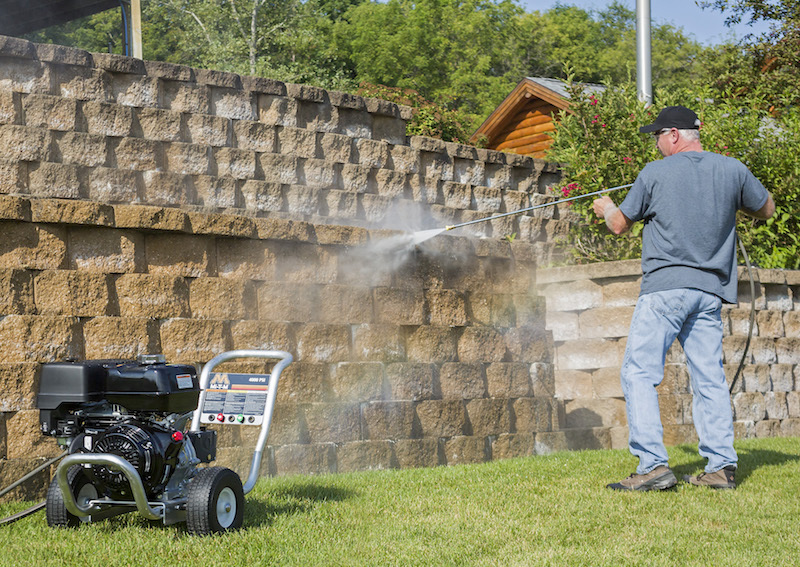 Whether your target is siding, sidewalks, or suspicious stains, a pressure washer will make fast work of most any job. If you’re in the market for a new pressure washer—and most times it makes more financial sense to buy, rather than rent—be sure you consult and buy from a reputable manufacturer. Mi-T-M has been in business since 1971 and we stand behind all our sturdy and high-quality machines. In fact, we offer a support center for all your service needs and a full line of how-to videos. What do I want to clean and how often will I use a pressure washer? What size pressure washer is best for my needs? What are the advantages of gasoline vs. electric models? Do I need a cold water or hot water pressure washer? As you shop for your pressure washer, consider the four following categories. What And When Can I Clean? The sky’s the limit when it comes to what a pressure washer can clean. If you name it—roofs, cars, decks, pools, grills, sporting equipment, and mailboxes—you can clean it. In mere minutes, your dirty items will look brand new. Depending on where you live, weather will play a factor in how often you can use your pressure washer. Some of you from more moderate climates (lucky you!) may be able to power up your machines a couple of times each month. Be realistic. How often will you use a pressure washer? How many items do you have that need regular cleaning? Knowing your needs will help you with the next section. No matter what household job you’re tackling, Mi-T-M has the right size pressure washer to help. In our consumer series line, we offer 24 different pressure washers. As you consider all the different types, note that the PSI (pounds per square inch) varies for each model. PSI is a unit of pressure and it’s what gives you the power to make short work of dirty jobs. 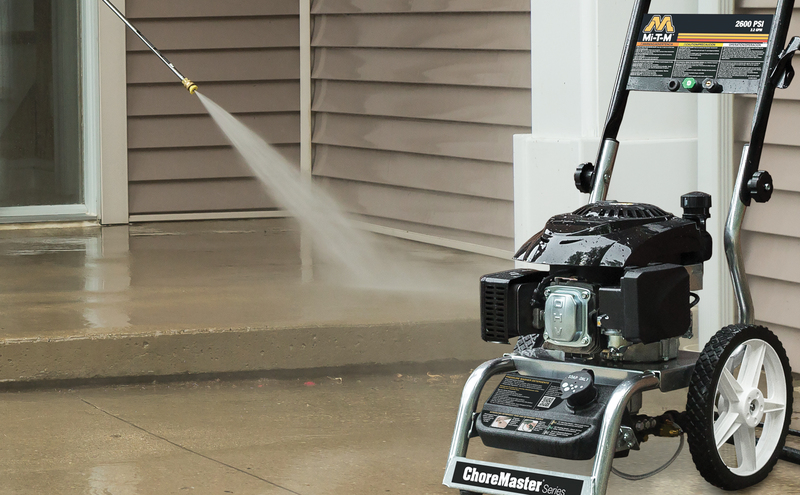 Our smallest pressure washer in the Choremaster series begins at 1400 PSI. This type of pressure washer is lightweight at just 45 pounds and easy to lift and maneuver. This size is great for weekly cleanings and is ideal for washing cars, small decks and patios and outdoor furniture. As you move up through our 24 different pressure washer categores, you’ll find machines that pack more power. Typically, the heavier duty, the longer the machine will last. Mi-T-M’s CV Series ranges from 2400 to 3000 PSI and models weigh a mere 54 pounds. At this level, the machine is designed to handle more frequent use and can easily tackle medium-sized cleaning jobs like larger decks and siding. At the higher end of the residential line, Mi-T-M’s Work Pro pressure washer series really delivers some serious power. These big boys begin at 2500 PSI and go up to 4000 PSI. Work Pro models weigh between 75 and 142 pounds. At this strength and size, the machines can be used daily and for much longer periods. These powerhouse can clean most everything! Should I Choose Electric or Gasoline? Electric pressure washers usually provide about 1000-2000 PSI and are great for small jobs around the house. They are safer, quieter, and much more compact than gas models. Gas engines, on the other hand, offer 2000-6000 PSI and can blast away the even toughest grime on boats, fences, siding, sidewalks and other larger objects. The highest performing gas machine, for example, is 10 times quicker than an electric machine at stripping paint off vinyl siding. Go back and review what you want to clean, how often you wish to clean, and how much you wish to pay. You should then have a clear idea if a gas or electric model is best for you. Hot vs. Cold: What’s The Difference? Temperature matters when it comes to cleaning ability. Both hot and cold pressure washers are effective, but Mi-T-M recommends you review your specific cleaning needs before selecting one. If your goal is simply to remove dirt and mud from outdoor areas, a cold power washer is just the ticket. Another plus: you can choose from more accessories (brushes, hoses, wands and nozzles) that fit cold water models. However, if you need to power through grease and oil, only a hot water pressure washer will do. Hot water washers also save time. If you plan to use your pressure washer more than a couple of hours per week, it simply makes more sense to invest in a hot water model. Mi-T-M hopes this buyer’s guide has helped you make an informed decision about what pressure washer is best for you and best for your cleaning needs. Remember: If you take good care of your pressure washer, it will last for many years. That’s why you want a dealer you can trust and one who is still in business when you need them. Mi-T-M offers generous warranties on all our machines, pumps, and engines. We’re always happy to answer questions and help. Call us toll free at 1-800-553-9053 or visit us online. If you’re like us, you love before and after home pictures. But you wouldn’t believe a few of the “before” images we’ve seen at Mi-T-M. In some pictures, you can’t even tell the original color of the vinyl siding, others show greasy and blackened driveways and garages, while some photos feature decks covered in slimy algae. Not only are these unsightly and unwelcoming sights, many of these spaces are slippery and dangerous. As a busy homeowner, it’s easy to let maintenance and home projects fall by the wayside. But what if you had an easy, economical and quick way to clean your property from top to bottom and from sidewalk to back fence? You do. Pressure washing is an excellent method to make fast work of built-up grime, mud, and mold and mildew. And at Mi-T-M, we’re your trusted provider of high-quality residential and industrial pressure washers. Nearly 45 years ago, Mi-T-M’s founder , AJ Spiegel realized the need for a portable, economical, and powerful cleaner. With a background in painting and cleaning, he built a 1000 PSI gas-powered unit. It was a humble, but important step. We’ve come a long way since then and today we offer hundreds of industrial and residential cleaning products and equipment. With a variety of sizes and types, our powerful Mi-T-M machines can help you tackle patios, driveways, decks, siding, pools, fencing, lawn furniture, and even prep for painting. Once dirty and unclean spaces suddenly transform into sparkling and polished areas. Those are exactly the types of pictures we cherish: the after photos. We’ve prepared this fun step-by-step guide on pressure washing to help you learn how to pressure wash your home. Used along with our short and informative videos, we believe you’ll be an expert in no time and your home will be the envy of the neighborhood. Brick homes are beautiful, sturdy, and timeless. Like other home surfaces, bricks become dirty, mossy, and need regular maintenance. Unlike many other home materials, brick is porous and more prone to discoloration and structural damage. Therefore, before you attempt to pressure wash your brick home, you should know the proper methods for cleaning. Follow these 7 basic steps of preparation before you use your pressure washer and you’ll be on the fast track to a newer, brighter brick home. Shut off outdoor electrical components and avoid high-voltage spots like your central air conditioner. Wear waterproof clothes, gloves, and goggles. Survey and study the surface. If you see cracks or holes between the bricks, you must repair them before you begin pressure washing. Carefully patch these areas with mortar and let them cure for at least a week. Once they’re dry, you can move to the next step. Soak and saturate your brick with H20 from top to bottom. Water helps prepare the brick for cleaning. It also prevents the bricks from absorbing harsh detergents. Test an out-of-the-way area. Use your pressure washer to blast away grime from a small space of brick. This experiment will show if you need to adjust your pressure washer settings before you get started on the entire home. Remember: You don’t need to harness the power of a tsunami to clean brick. Turn down the PSI until you find just the right setting. Apply pressure washer detergent. Choose only cleaners designated for cleaning brick. Spray the detergent from bottom to top to prevent streaking. Allow the cleaner to soak into the brick surface for 5-10 minutes. Do not allow the detergent to dry on your surface. Check for extra challenging stains. If you find an especially dirty area, use a rotary scrub brush. This will help loosen the grime and is a safer approach than cranking up the pressure washer. Reverse, rinse and repeat. When you applied water to moisten the brick, you sprayed from bottom to top. Now, to clear the detergent and reduce residue, you should gently spray water from top to bottom. Some people, once the brick is dry, opt to apply a brick and mortar sealant. Your local hardware store can help you select one that’s made exclusively for brick. There you have it. With just seven easy steps, you’ve improved the look and extended the life of your brick home. Aren’t you glad you didn’t build your home of straw? Now that we’ve shown you the proper techniques for pressure washing brick houses, we’d be remiss if we didn’t explain how to pressure wash homes with vinyl siding. Vinyl siding is used on more than 32 percent of new homes in the U.S. It’s a low-maintenance, inexpensive material that never needs to be painted. But it’s also notorious for accumulating mold, mildew, dirt and debris. And because vinyl siding is malleable, you cannot blast it with too much force. Follow these easy steps and you’ll be well on your way to uncovering a home with tons of curb appeal. Put safety first. As with any outdoor pressure washing job, avoid electrical lines, conduits and outdoor appliances. Cover any exposed outlets. Pick the right tool for the job. You’ll want at least 3,000 PSI to reach high, out-of-the way places. Whether you prefer a gas- or electric-powered pressure washer is your choice. But Mi-T-M is happy to discuss the best fit for you. Protect any shrubs and bushes that might be damaged your by high-pressure spray work. Use a drop cloth or a plastic tablecloth to cover them while you work. Scan the surface of your vinyl siding. If you notice any particularly moldy spots, you should pre-treat them with a mixture of bleach and water. Scrub the spot with a sponge by hand and rinse with water. Pre-treat a test spot with the bleach mixture before proceeding to the next. Get ready to apply detergent to your vinyl siding. Be sure to use cleansers made especially for pressure washers. 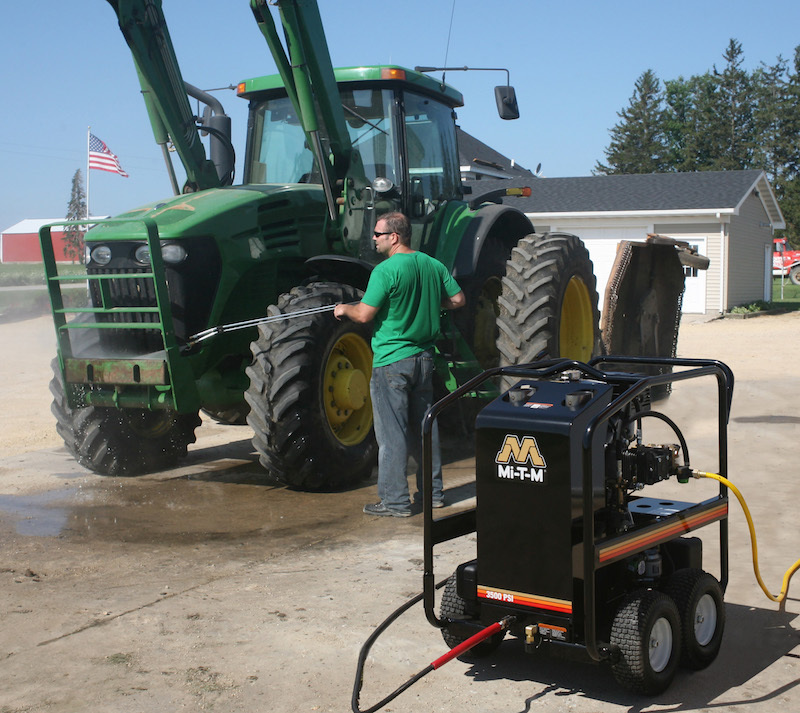 Mi-T-M offers pressure washers with injectors that mix your solution right into the jet spray. Test your pressure washer on a small spot of vinyl before you clean the whole kit and caboodle. This will give you a good measure of the power you’ll need. You can bump the impact on the surface by putting less distance between you and the siding. Remember, more distances equals less pressure. Apply your soap mixture using a lower pressure setting. Working from bottom to top, aim for smooth and steady strokes with your wand. Sweep your washer from left to right using overlapping strokes. Keep the wand pointed slightly downward to avoid spraying underneath the gaps in the vinyl siding. Allow the cleaning agent to sit and soak into the vinyl for about 5-10 minutes. Just be sure you don’t let it dry on the surface. Begin the rinse process with fresh, clean water. Again, start at the top and work your way down with the pressure washer to prevent streaking. Now, step back and admire your handiwork. If you’ve followed our tips and techniques above, your home should look brand spankin’ new. Well done, weekend warrior. Well done. You may not be the captain of a ship, but you can make sure your own deck is in tip-top shape. But don’t do it the old-fashioned, backbreaking way. Let Mi-T-M provide just the right equipment and training. You love your deck. It’s a great place to read, relax and entertain. Make sure you learn the proper way to preserve and protect it. Rather than bending over and scrubbing each square inch of your home deck, use a pressure washer to blast away the months of grime and goo. But first, do no harm. Remember that the surface is sensitive. Before you begin, read and follow our suggested tips and techniques below. Sweep, rinse and wet your deck thoroughly. Make sure you’ve removed all debris and dirt. Wear waterproof clothes, gloves, and goggles. Find the right pressure setting via the unloader valve. Turn the unloader counterclockwise for lower pressure and clockwise for higher pressure. For example, soft woods like pine require much lower amounts of water pressure. Pick an inconspicuous test spot and start the pressure at about 600 PSI. If you need to go higher you can, but starting with lower pressure prevents irreversible damage. Remember that pressure washers can clean brick (as we explained above), but you don’t need that kind of power for a wood deck. Use quick connect tip nozzles with 25 or 40 degree output. A quick connect nozzle ensures you can cover a larger surface area and spreads out the force of the pressure washer. Start with a back and forth spray motion about two feet from the ground. Never allow the nozzle to get too close to your wood deck. Damage to your wood surface may occur. Remember safety at all times. Never point your nozzle at animals, people, or glass. This may seem like a no-brainer, but many people don’t realize the power a pressure washer packs. Avoid accidents and focus only on your deck. You’re heard the expression: don’t go against the grain. That certainly applies to this pressure washing your deck. Work with the grain of the wood. Why? Doing so will prevent uneven spots or cleaning edges. Begin pressure washing where your deck meets your home foundation and spray out excessive dirt and debris. How was the deck swabbing, matey? We’re betting you can’t wait to invite your friends and neighbors over for a BBQ on your “new” deck. Ever noticed just how much concrete is on your property? Your driveway, sidewalk, steps, porch, patio and—if you’re lucky enough to own one—pool—are all made out of cement. Ever notice how dirty these spaces can become? Whether you have months or years of grime to clear, Mi-T-M is here to help. Our pressure washers will make quick work of discolored and dirty concrete. 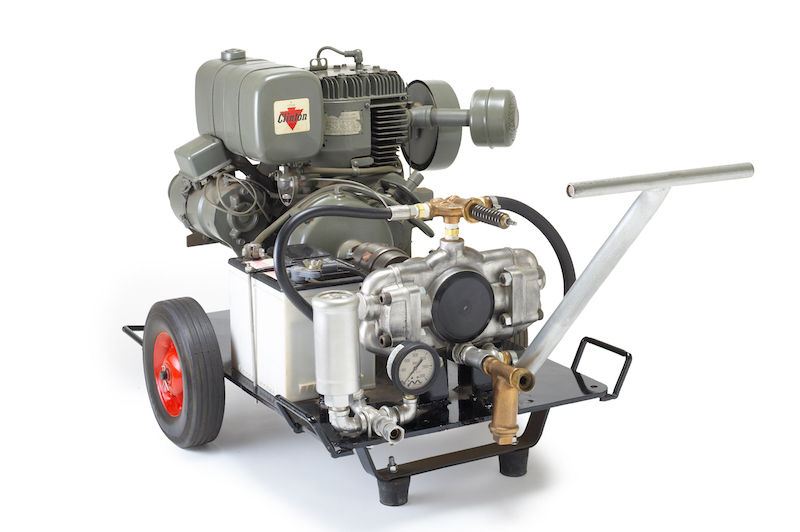 Choose from our large selection of gas- and electric powered pressure washers. No matter how large the job, we’ve got the perfect pressure washer to blast away many layers of gunk. We also offer a wide variety of other equipment that will help make cleaning a snap. Remember the three P’s of concrete: It is porous, it is penetrable, and it is permeable. What does this mean for you? Well, though it may look hard as rock, you need to use a little common sense and TLC when you’re using a pressure washing to clean concrete. Start by making a clean sweep of things. Sweep or blow away all excess dust and debris. Pick up and move things like lawn furniture, toys, and potted plants that could be damaged during pressure washing. Next, think about your plan of attack. If you’ve got a lot of surface area to cover, split up your concrete cleaning into segments. Doing so will allow you to focus on one task at a time and not feel overwhelmed. Once you tackle one area, move on to the next. You won’t wash the same space twice and you’ll be able to take breaks, as needed. Though Grease was the word for John Travolta and Olivia Newton John, it doesn’t belong anywhere on your property. Grab your bottle of degreaser (you did remember to buy one, didn’t you? ), attach your soap injector to the pressure washer and apply degreaser your concrete. For really tough stains, you can use a stiff brush to work the degreaser into the concrete. Now it’s rub-a-dub time. Mi-T-M will help you find just the right detergent for the machine you purchase. Attach your spray wand, use the soap tip, and begin applying detergent. Go grab a cold one from the fridge. Be patient and give the detergent up to 10 minutes to soak into your concrete. It’s working . . . even though you’re not. Now it gets fun. When the detergent has permeated your concrete, it’s time to blast away all the accumulated suds and soil. You’re about to see the fruits of your labor. Switch to a high pressure spray, keep your nozzle at least 10 inches away from the surface and use smooth back and forth motions, overlapping each pass by five or more inches. For really dirty patches, you may need to make several passes with your pressure washer. Mi-T-M also has rotary surface cleaners available for large surface areas that are capable of cleaning larger surfaces faster and easier than a standard cleaning nozzle. You’re done! It’s high time to stand back and admire your porch/patio/sidewalk/pool/driveway/garage/other concrete area. We’re betting the sparkling surface is clean enough to eat off, mate. And yes, you deserve it, so go grab another cold one. Now that you’ve pressure washed your way to a gleaming home and sparkling exteriors, don’t neglect other property areas like your fences. We’re human and we notice what’s different. Even though your castle may look like new, if it’s bordered by a filthy fence, people will probably notice the fence first. So, to maximize your curb appeal, finish with the fence. You’ll be amazed by the transformation. Underneath the moldy or mildewed grey or black color of your current dingy wood fence awaits a beautiful surface waiting to be rediscovered. With a bit of elbow grease and time, you can restore the former luster of your fence. A Mi-T-M pressure washer is ideal for the task. That’s because the power of the spray will blast away the outer layer of old wood cells to reveal the beautiful wood underneath. “Wood” you believe it? You’ll save on the cost of a new fence and will prolong the life of your current fence. Pick the right pressure washer for the job. It’s like Goldilocks and the Three Bears: Too weak and small and you won’t see any difference. Too powerful and big and you’ll damage the wood and leave erosion and cut marks behind. A good electric model should offer about 1,000-1,500 PSI; a gas model should pack a 2,000-2,500 PSI punch. Choose the best cleanser for your fence. Acid-based residential cleaners are easy, but may not take care of really tough stains. So you may wish to consider a commercial grade detergent. Speak with the experts where you purchased your Mi-T-M pressure washer. You may want to show them a “before” picture of your fence for reference. Clear away any objects or tie/cover plants and bushes near the fence line. This will give you direct access to the fence and prevent damage. Select the right sprayer tip. We recommend a 25-degree tip to begin. However, if find you need more power, you can switch to a 15-degree tip. Power wash a small section of wood see if you’ve got the right degree of pressure. Wear waterproof clothes, gloves, and goggles. The force of the spray will feel like Niagara Falls. Stay dry; stay safe. Power up the machine and begin applying the detergent. Hold the sprayer about 3-4 feet away from the fence. Stay in motion. Keep moving and fanning the sprayer to avoid damaging the wood. Use different angles and move in closer if needed. Let the cleaning solution sink in and do its magic for about 10 minutes. Just keep a watchful eye to make sure it doesn’t dry. Celebrate a job well done. Well? What do you think? Did you, in your wildest dreams, ever think it was possible to see results like these? These are the types of before and after images we love so much at Mi-T-M. If only looking younger were this easy. We hope our tongue-in-cheek guide has shown you how truly easy it is to use a pressure washer to accomplish most any outdoor cleaning task. For nearly 45 years, Mi-T-M has helped customers across the world. Those same customers report that they appreciate our performance, quality, value and dependability. We know the pride of home ownership. And it’s why we’re so excited to hear success stories from those who have used our equipment and our products. It’s a great feeling to stand back and admire the fruits of your own labor. And it’s also a great feeling to see the dramatic difference our pressure washers can make on an enormous variety of items including your home, car, lawn furniture, boat, RV, car, driveway, windows, fences, playground equipment, deck, garage floor, and oh gosh, we could go on and on. At Mi-T-M, we’re proud of our long and excellent reputation. Here’s our vow: We promise to deliver unmatched performance—from the quality of our products to the dedication of each employee who does what’s right for our customer every time.